The philosophy of the great and highly regarded 19th century German thinker, Arthur Schopenhauer, intersected with what he considered the highest art: music. Music which is sublime for one person, may often be similarly shared with others. What music is most meaningful to you? We would like you, our audience members, to contribute ahead of time, musical works or parts of music that specifically provide you deep gratification, whether it be of comfort, thrill, or any other strong, emotional satisfaction. 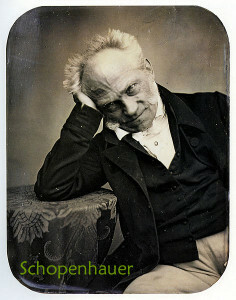 These experiences, we consider to be Schopenhauer moments. ~~~ Has the contemplation of musical beauty ever helped you transcend your own personal suffering or hardship?